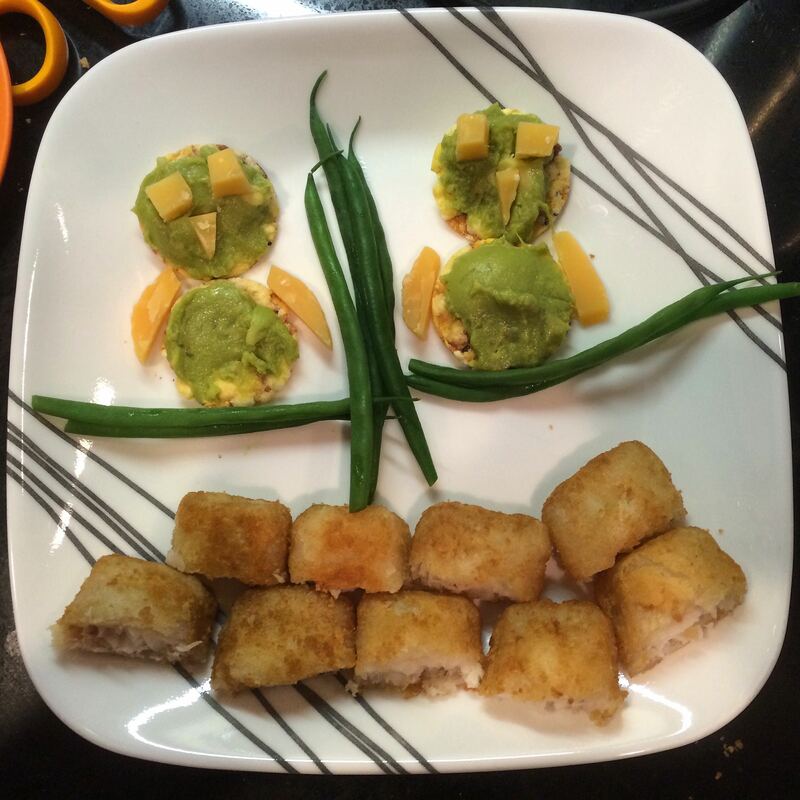 Before I had kids, I had this grand idea that my kids would have an ever expanding food palate. I promised myself that they would not have a diet that consisted only of chicken nuggets and mac & cheese. For the first few years of Big Brother’s life, I actually achieved that goal. I was so proud (perhaps too proud) of the fact that I had a two year old that would eat Brussels sprouts with gusto. But then something changed and I was made to eat my words. (See what I did there?) Foods that he once gobbled up, he now turned his nose up at them. It is so deflating to put energy into preparing a meal to have it greeted with whiny tears and pleas for hot dogs. Once Little One came on the scene, a mixture of a busy life and exhaustion plus a newly found picky eater led to way more frozen foods than I wanted to admit. 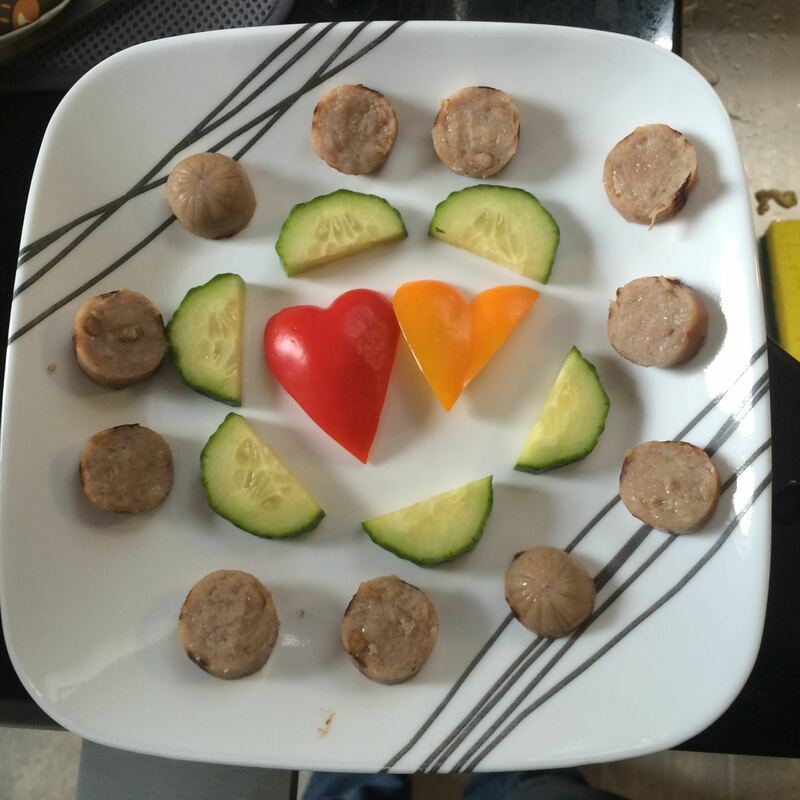 I’m longing to get back to my adventurous eating children so I have been making efforts to make that a reality with a few tricks that sometimes work like a charm. Another trick up my sleeve takes a certain amount of patience and juggling. The idea of having the kids help me cook or prepare food can sometimes be much better on paper than in reality. If Dada is home, the task is easy because we have the power of one on one, so this happens a lot more on the weekends. For meals when Dada’s help is not possible and Big Brother is helping me at the stove, which he loves to do, I need to have a task for Little One or else he’s reaching for everything hot and dangerous and then I loose the zen I focus on and feel overwhelmed. Then nobody’s happy. Little One sometimes enjoys the simple task of moving fruit from its container to the plate. 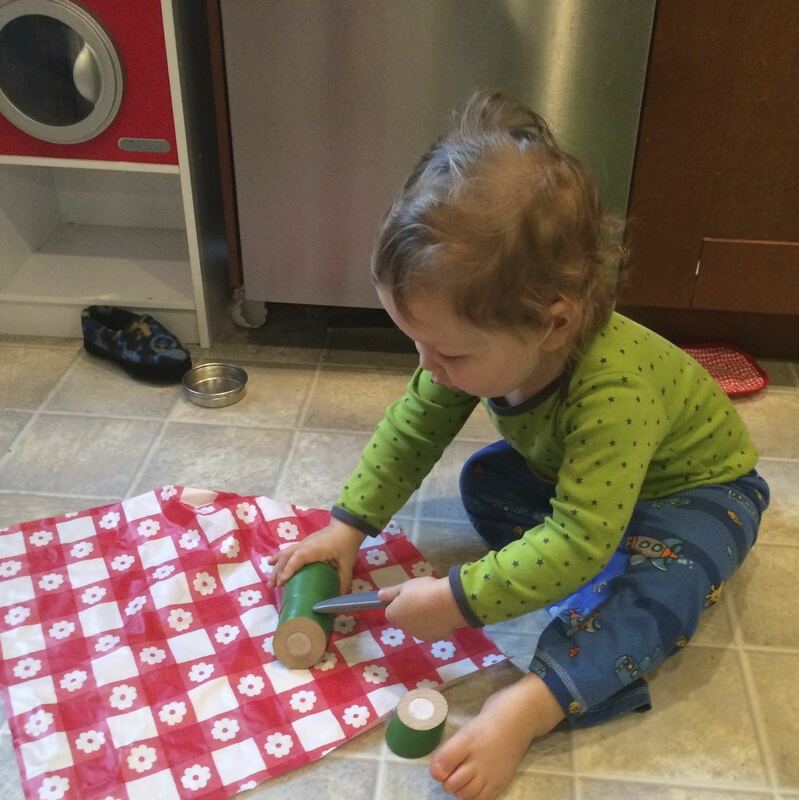 Or when I need him to be occupied for longer, I set him up with a food prep task (or a pretend one) in his high chair so that Big Brother and I can focus on cooking at the stove. The kitchen is always a great place for real life math. From measuring and counting to cutting in halves or quarters. We are often discussing the shape and comparative size of foods or the concepts of more or less. The power of helping is strong. A meal they would normally reject immediately, instead they are super excited to eat. This works especially well for Little One, who is heavily focused on doing everything all by himself. So when the meal is presented, he is proudly telling everyone that he made this meal all by himself as he takes bites. Anytime I am planning on introducing a new meal, I have the boys assist because it almost always guarantees at least three to four enthusiastic bites before they decide they will be refusing to eat it. They say it can take up to fifteen tries of a new food before a child will decide it to be worthy of their consumption. So if I can get three or four bites, then we’re taking small steps towards acceptance. Hopefully. This isn’t a trick but simply a fact I have discovered through trial and error. Having my kids eat a good meal relies heavily on timing. Timing of when the meal is served and when they had their last snack. Especially dinner. The closer to bedtime and the more tired my kids are, the less they are going to eat. This took me a long time to realize. Maybe I was just slow to putting it together and I’m sure many people are already clued into this…but I was impressed with how smoothly dinner went simply by serving it earlier in the evening. Sometimes this means having dinner before Dada gets home from work, which is a bummer. But I much prefer a peaceful, successful meal. And then there are the snacks. Oh man, the snacks. I realize every kid is different, but for my kids I find that in most cases, snacks just ruin meal time. So when they must have a snack, I really try to lean towards small, no sugar and and as little carbs as possible: cheese, veggies or maybe a little fruit. Sometimes we just start with a glass of water before a snack because that can cut down on the portion size of the snack. My final effort in getting kids to eat is not groundbreaking in the least and it is often used at dinner tables everywhere and that is the promise of dessert. This is a very slippery slope because I try to limit their sugar intake as best I can. So we have two designated dessert days marked on our weekly calendar to prevent the demand of dessert getting out of hand. Dessert is rather small in portion, as in one cookie or one piece of chocolate. This has proved to be a strong motivation for Big Brother to read and understand the weekly calendar. Every single night there is a discussion about if it is a dessert night and we study the calendar counting the days until the next one. This also helps in grasping the concepts of yesterday, today and tomorrow, which sometimes eludes him. 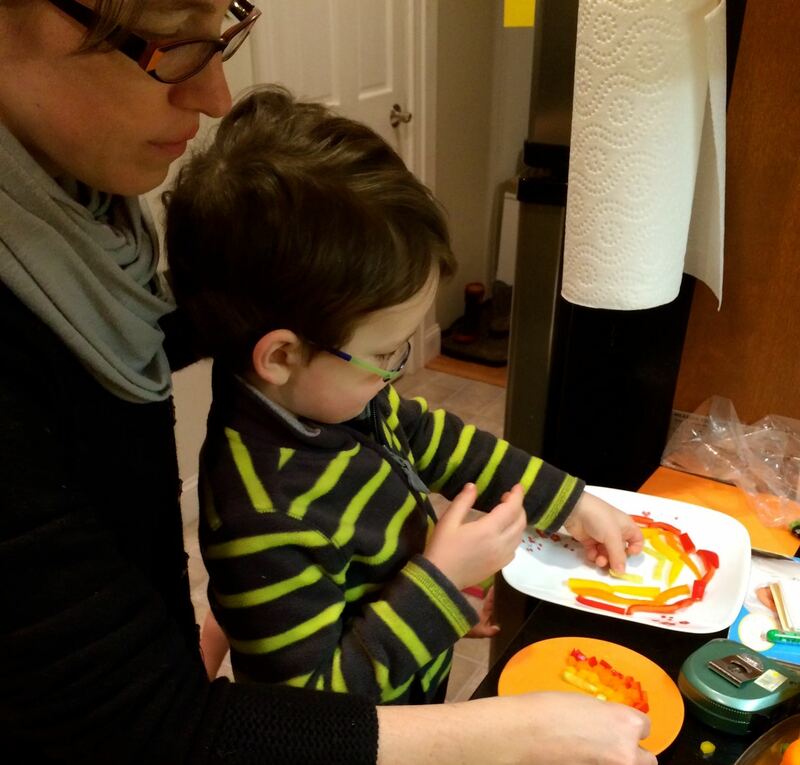 (so much natural learning surrounding the dinner table, isn’t there?) These are the nights when I try to introduce new-ish foods and lots of veggies because the rule is that you have to be a member of the clean plate club in order to obtain the coveted dessert. Be assured that this “clean plate” rule can at times lead to some tears and impressive negotiating skills on Big Brother’s part. There is some disagreement surrounding the concept of the clean plate club. Some people feel that this works against teaching kids to listen to their bodies and knowing when they are truly full. I keep this in mind and try to keep our food portions appropriate for them to actually finish. Some nights, Big Brother tells me he is full and I always tell him that he can be finished whenever he wants, but that dessert is off the table. Of course, Little One is a long way off from discovering the concept of delayed gratification so this bargaining chip is not as effective on him. Now I’m eager to hear your feedback on how things go around your dinner table. What tricks do you have up your sleeve for making meals more appealing to your family?